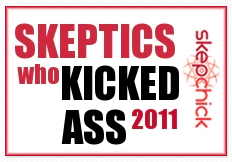 » A register for quacks and bad science journalism. Wow, what a stinker this article turns out to be. Not just because of the content, but also the credulity of the journalists. This story appeared on SMH online today. It details plans to establish a register for quacks, apparently in an attempt to separate the wheat from the chaff. Sounds a little bit like the register set up in the UK recently and blogged about here. I read this article with trepidation, firstly because I think putting quacks on a register lends legitimacy to their profession and this is undeserved in my opinion. Yes, the industry was dealt a blow, but this was not because of a shonky homeopath, this was because homeopathy does not work in the treatment of eczema. Or any other illness in fact. A meta-analysis published in the Lancet in 2005 compared 110 conventional and homeopathy trials and the effect of homeopathy was deemed no greater than placebo (Shang et al., Lancet 2005; 366: 726–32). An editorial which appeared in the same issue of the Lancet stated; “despite 150 years of unfavourable findings…the more dilute the evidence for homeopathy becomes, the greater seems its popularity.” Why we keep wasting money and good science on testing it, to continually get the same answer is beyond me. University of Queensland researcher Jon Wardle, who heads a steering committee to set-up a register said; “We are making sure that when the public sees a naturopath they have training, act ethically and if something goes wrong, there is a complaints procedure,” he said. Mr Wardle said the lack of formal accreditation meant people with as little as one week’s training could call themselves naturopaths and it is these people who dispense a large quantity homeopathic remedies. This is where I get annoyed. Firstly, there is a complaints procedure in NSW. It was established with the new Code of Conduct for Unregistered Practitioners which was introduced in August 2008. Section 17 of the code states that practitioners must display the Code and information about the way in which clients may make a complaint to the HCCC if necessary. Funny that, I went to Mind Body Wallet a few weeks back armed with my code and saw it displayed nowhere, neither at stalls doing invasive procedures such as live blood analysis, or massage or anywhere. I have to say, I am not convinced that the relevant regulatory bodies/associations or members of them are particularly concerned about following the rules when it comes to legislation. In NSW at least, they seem to have dutifully ignored conforming to this recent legislation. I am suspicious that the establishment of a nationwide register is really just a sneaky way to add undeserved legitimacy to profession where there is scant evidence for efficacy. But this is not the worst part about this article. The article was penned by 2 journalists, Rachel Browne and Melissa Singer, neither of whom seem to understand much about what constitutes conventional medicine or doctors. They refer to a British podiatrist and homeopath Tariq Khan, as Dr Khan. This is misleading and infers that Khan is a clinical doctor, naturopaths use the title ND, (and referred to by some as not a doctor). They tell us that Dr Khan recommends homeopathy be used in conjunction with conventional treatment. And of course a homeopath is going to endorse the use of homeopathy. The man apparently had talks with the head of dermatology at St George Hospital, Dedee Murrell, to discuss using homeopathic remedies for an incurable disease, the rare genetic condition epidermolysis bullosa. Let me state that again. Homeopathy as treatment for an incurable disease. 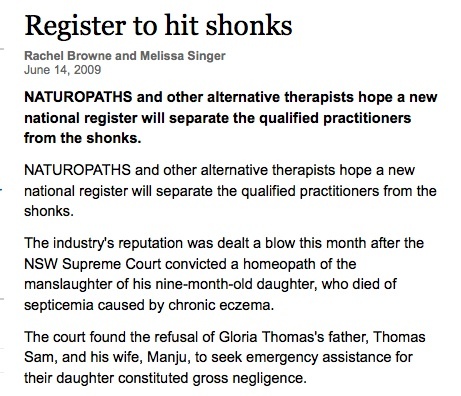 This following the beginning of the article where the journalists discuss the parents of Gloria Thomas being charged with manslaughter for shunning conventional medicine and treating their daughter’s eczema with homeopathy. She subsequently died. This is very poor journalism. To begin an article with charges of manslaughter for a homeopathy-related death and then discuss using it for incurable diseases is just credulous on the part of Rachel and Melissa. Precisely Rachel and Melissa. There is research. To show it does nought. Take a look at the Lancet article. Visit PubMed for goodness sake. Do some research, please.